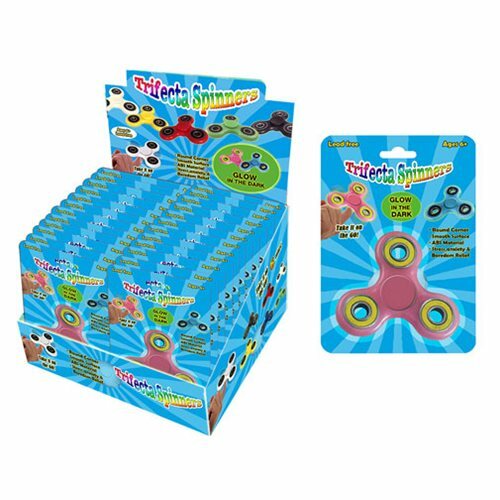 Get spinning with the Fidget Spinner! In glow-in-the-dark colors, these Fidget Spinners are small enough to fit in your pocket so they can go everywhere with you. Featuring 3x outer bearings around a center bearing, you can spin it in one hand! How long can you spin? Ages 6 and up. The Trifecta Spinners Glow-in-the-Dark Display Case includes 24x individually packaged spinners in a variety of glow-in-the-dark colors. Please note: This item comes in a variety of colors. We cannot accept requests for specific colors, nor can we accept returns on opened items. The item you receive may be different from the one pictured.